Steep Canyon Rangers Private Label wine is here just in time for the Holidays. Surprise the Steep Canyon Ranger fan in your life with this wonderful wine. “A few weeks ago I purchased a Chassagne-Montrachet Clos Saint Jean Premier Cru at your store while visiting family. I asked you what to expect. You said something along the lines of delight. I shared it as one of the four wines we had at dinner. Different wines for different courses. It was beyond a delight. It was loved my everyone who tasted it. It did cause a problem in that I only bought one bottle and from what I heard from all present, more would have been better of this wonderful wine. Thanks for recommending it. I hope to find more treasures on my next visit. 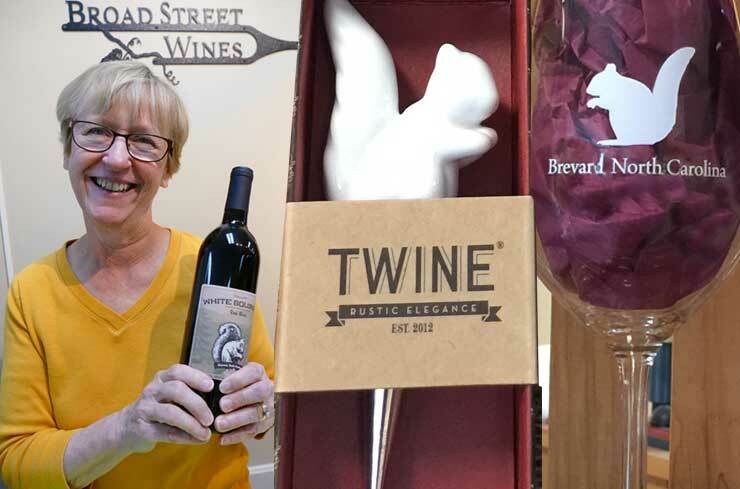 When we started on our quest to combine great wine with Brevard’s unofficial mascot, the White Squirrel, we decided to create our very own private label, White Squirrel wine. We had such an overwhelming response from our customers, they loved the idea and the wine, that they asked for more White Squirrel pairings and we delivered with the White Squirrel Wine Stoppers (another great pairing). With the Holidays fast approaching we put on our White Squirrel Thinking Caps and came up with next natural squirrelly item which was…wine glasses. 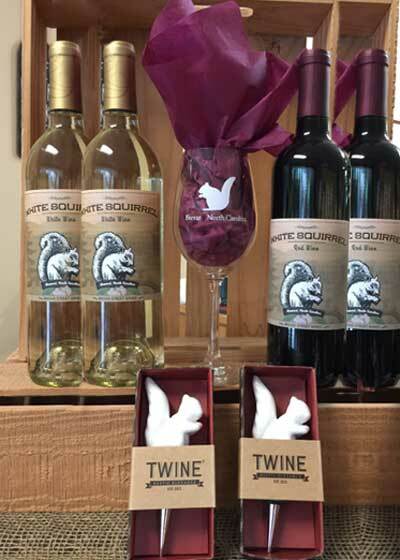 They are the perfect complement to the growing selection of White Squirrel wine items we offer, and if you like White Squirrels and wine as much as we do, then these glasses will make a brilliant addition to your wine and squirrel collections. Gift sets are available. Broad Street Wines is located in the center of beautiful downtown Brevard, North Carolina, also known as “Land of the Waterfalls”. This boutique wine store is Brevard’s favorite wine, beer and cigar store, and a cozy spot where the locals and visitors alike enjoy weekly wine tastings and good conversation. You will meet Connie the owner of Broad Street Wines, who is a wonderful host and she is incredibly helpful in making great pairings and finding the perfect bottle of wine for; rounding out your collection, or celebrating a spirited occasion or for just sitting back and watching the sun set from your favorite spot. We stock a rotating selection of hand-crafted beers from around the world, including seasonals from the Northwest, a wide selection of Belgians and a mix of obscure bottlings from some of the beer world’s best brewers. Whether you’re a seasoned cigar aficionado or just starting out, our friendly, knowledgeable staff can help you find the perfect cigar. We stock the finest hand-made cigars at the best possible price. Choose from famous brands like Avo, Don Carlos, Diamond Crown, Cohiba, Arturo Fuente, Romeo y Julieta, Macanudo, Gurkha, and Monte Cristo. 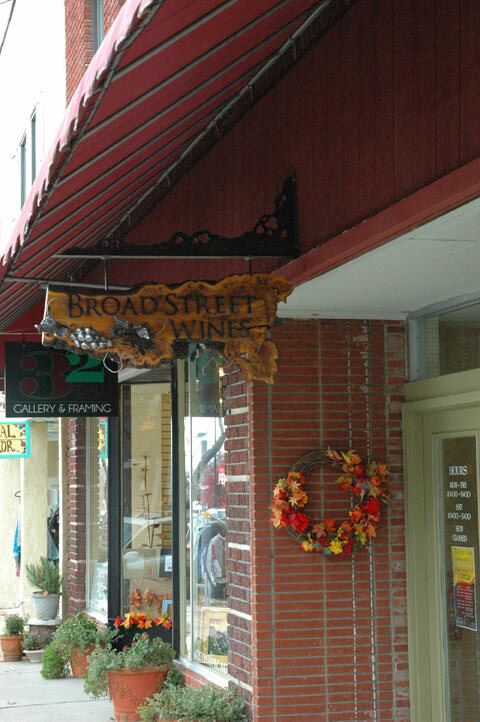 Broad Street Wines, Gifts and etc. Broad Street Wines has an uncommon selection of special gifts for the wine, beer, or cigar connoisseur. From hand painted wine glasses to high quality cigar cutters, you’ll always find the perfect gift. Broad Street wine club Become a member and receive notice of on-line promotions and discounts by the case. Ask for details. Tasting Join us for weekly and special event tastings. Bring your friends and enjoy our cocktail party atmosphere! Wine, beer, and cigar sales subject to state and local laws and regulations. Offers are void where prohibited. Due to state and local regulations, wine, beer, cigars, prices, discounts may be subject to change. Please taste, learn, smoke, and enjoy wine, beer, and cigars responsibly. Must be 21 years of age or older. Stop by for our Big Sale on Saturday, Feb. 23, as we are making room for new wines that we have had the opportunity to taste recently. We will have tables of wines at reduced prices. All other wines will be priced at 10% off, 15% off mixed cases, and 20% off solid cases.